In a region so famous for particular varietals, other wines from the same place can appear like second-class citizens. Such is the case for Burgundy’s “other white,” Aligoté. When we consider Burgundian wines, we naturally think of Pinot Noir and Chardonnay; but other remarkable wines, like Gamay and Aligoté (al-i-goh-tey), are produced there, too. Aligoté, often in the shadow of its Burgundian sister, Chardonnay, is gaining its own enthusiastic following. With its driving acidity, bright fruit flavors and solid fruit set, more people appreciate the wine’s approachability and intrigue. 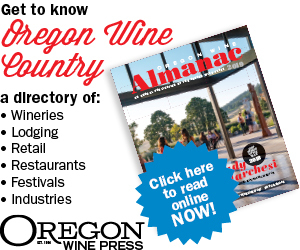 And Oregon winemakers are taking notice. Pale straw yellow in color, with hints of gold, Aligoté encompasses a delightful range of aromas, including green apple, white peach, white flowers, lemon, hazelnut and herbs. It forms the base of the classic and tasty Kir cocktail. I asked Russell Lichtenthal of Flâneur, “Why Oregon Aligoté?” He jokingly replied, “Why not?” The Willamette Valley has a history of comparing itself to Burgundy. When Flâneur wanted to diversify its portfolio beyond Pinot and Chardonnay, logic dictated that since Gamay, Burgundy’s “other red,” is enjoying popularity, maybe exploring Aligoté also makes sense. Chad Stock of Minimus Wines and Craft Wine Co. notes, “Aligoté has sound reason to be in the Willamette Valley based on climate, and what we have achieved with Pinot Noir and Chardonnay. Add the Burgundian narrative many Oregon vintners model their wineries after (indicating it could adapt from a marketing perspective) and that we didn’t know anyone who was attempting to grow it, the Aligoté proposition was exciting and mysterious at the time.” So far, the results are promising from farming yields, winemaking adaptation and market/consumer demand. Winegrower Dai Crisp of Temperance Hill Vineyard and Lumos Wine Company recalls his first experience with Aligoté 30 years ago in Paris. He says it was so delicious it had a lasting impact that led to his planting an acre of it on Temperance Hill. This will be the third year for these plants, which harvested enough for a barrel this past vintage. Flâneur recently decided to plant one acre of Aligoté on a new vineyard site because it grows well in cooler climates and creates wines of great energy and tension. According to Grant Coulter of Hundred Suns Wine and winemaker/director of vineyards for Flâneur, they’d been harvesting exceptional Chardonnay from this hillside, so when they started the discussion about what to plant on this higher-elevation slope with basalt soils, it seemed suitable for white varietals like Aligoté. Winemakers agree Aligoté has tremendous food pairing possibilities. Seafood and oysters highlight saline notes, but it’s also great with poultry or roast pork, or, at the end of a meal with fresh or aged cheese. Wylde suggests Waldorf salad, shrimp spring rolls or pork pho. 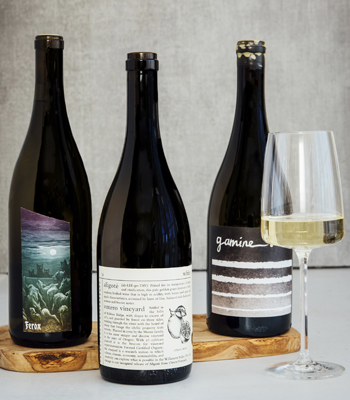 Norris says her first vintage of Aligoté is delicate and feminine — she’s made two vintages so far — so she likes it with bounty from the Oregon Coast this time of year: Dungeness crab, cod, rockfish. Stock contends his Aligoté tastes heavenly with the Quattro Formaggi pizza fresh out of the oven from Pizza Capo in McMinnville. He says their margherita pizza works well also because of the intense fresh basil. The wine has enough acidity to stand up to the tomato sauce, plus the yeast expression from long lees aging in old barrels echoes the sourdough crust. Sounds perfect.